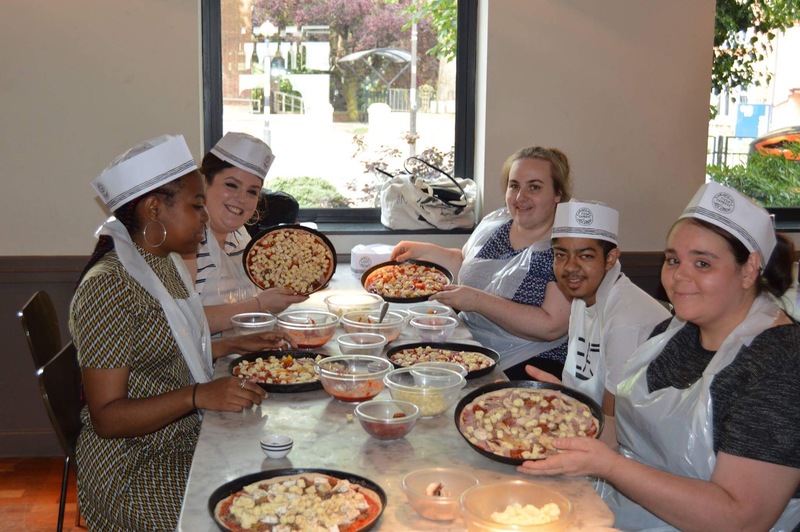 Thanks to Pizza Express in West Bridgford the young adult’s were able to practice their culinary skills by taking part in a pizza-making workshop. On arrival we were met by friendly chef Chris who led us through the process. Chris even tried to teach us some impressive tricks such as flipping the pizza bases. Nobody quite mastered it but fortunately no pizzas hit the floor- although some did come pretty close!. We loaded the pizzas with our favourite toppings (everything from red onion, to pepperoni, to spicy chilli beef) covered them in mozzarella and with one final pinch of oregano we sent them off with Chris to the pizza oven. When the pizza’s arrived back at the table they were piping hot and looked delicious… and they tasted it too! Not only did our young adult’s learn a useful new skill but thanks to the friendly staff at Pizza Express we had an extremely fun and memorable afternoon. The group were keen to try our their new skills again at home and there was lot’s of discussion about which recipes and cultures we could try out next. up a strong support network. be trying our bushcraft skills and having a BBQ! Our weekly Youth Club runs from 7-9pm at the Monty Hind Centre. There is something for everyone so come along, get involved, meet new people and have some fun! Activities include: Arts & Crafts Sports & group games Coffee bar & tuck shop Pool & table tennis Projects & achievement awards Support & advice For further information, please call us on: 0115 970 9421. Youth Club helps me to get away from everything and talk to people about any problems I am having. It’s great having my own space and time when I need it.